The bloom was recently reported to be 80 miles long and 50 miles wide, reaching from Dixie County to southern Pasco County, according to the Florida Fish and Wildlife Conservation Commission’s (FWC) statewide update on Aug. 1. Waldo: At 40 miles from the Pasco/Hernando border, red tide was detected at the surface and to depths of about 25 meters (82 feet) in areas where it was indicated by satellites. Bass: At the outer edge of the bloom, elevated chlorophyll associated with the red tide was present in waters as deep as 40 meters (131 feet). Both: The bloom water is “stratified” (layered) with denser, cooler water below and lighter, warmer water on top. Waldo will complete his mission this week or early next, while Bass will finish in two to three weeks. 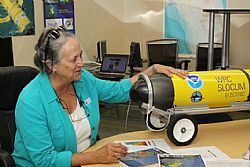 The robots’ data are feeding into short-term forecasts of the red tide bloom developed by the Collaboration for Prediction of Red Tides, a partnership effort between the Florida Fish and Wildlife Conservation Commission (FWC) and USF.